Late last week I managed to get away for a few days in the Ruahine Range. Work commitments meant I wasn't able to go in with a couple of friends, but I followed them later and met them at Top Maropea hut, a delightful place that overlooks the heart of the central Ruahine Range. Although the weather wasn't great (as you can see), it stayed dry when it mattered most, and the ferocious winds typical of this part of the Ruahine even abated a little at just the right time — namely, when we were crossing the tops. Those couple of nights in wild country did my soul good. I love the mood of this image. It recalls that feeling I get when I can finally see the end of the leg of a difficult journey. That looks like somewhere where tension just slips off your shoulders. Beautiful. And I love the moody light. So much vegetation everywhere. No raw dirt or rocks to be seen. Mats and carpets and curtains of plants. Wow. My favourite place in the Ruahine. What a pleasure. This moment gets it so well. Thanks Brenda. It's actually not too difficult to get to if the weather's reasonable, but it's great to arrive no matter what the journey's been like. EC, it is indeed the sort of place where life becomes simple, and that's a real treasure. Zhoen, it's a bit deceptive — there's bare ground in places and plenty of rock. The vegetation's a fairly thin skin. Kia ora Robb — a delight to be able to share it with you and John. I think part of me's still there. Good stuff. Did you head down to Maropea Forks the next day? I suppose as one of the few four bunkers left, it has achieved "historic" status. 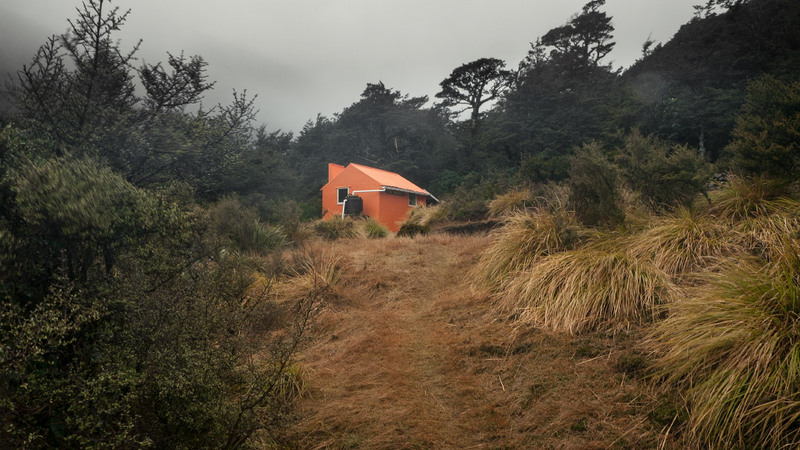 This is probably why DOC has painted it in NZFS-orange like Waterfall hut. Jono, I followed some friends in a couple of days after they'd gone in to Maropea Forks; I met them on the track on their way back the next day, so I didn't get to Maropea Forks. We stayed at Top Maropea and walked out the next day, meeting two other parties heading in; both were intending to stay that night at Maropea Forks, so it would have been fairly crowded with nine people there. Let me know when you're heading for the Ruahine again.